check the questions and answers below. so the chances are this will get you running quickly. What is the recommended hardware specification? I cannot send mail from my email clients to Mailtraq. Check that your email client's SMTP entry is set to the Mailtraq machine, by IP address (preferred) or by machine name. Working with Outlook - look here. Make sure you have set your LAN (local network) settings correctly in the Mailtraq console. If your email client is outside the LAN read about 'SMTP Service | Relaying Tab' settings here to see how to configure the necessary permissions correctly. Make sure that your firewall and router are set to allow traffic on port 25, 110, 80, 143 and any other services you are using to and from the LAN to the Mailtraq machine. This page explains how to test. Make sure your anti-virus software is not getting in the way. This page explains more. Make sure that Windows has not enabled the default SMTP service. You may get a 5.7.1 Relay Access Denied message, or similar. This can happen after a Windows Update. This page explains how. Mailtraq is cycling on and off: check that there are not unresolved Exceptions in the Event Log. This page explains how. Check that you have a valid license - that a trial has not expired or that you have added more users than your license allows. The 'About Mailtraq' dialog will tell you your status. This page explains more. Check that Mailtraq does not think it has to little free disk space to run safely. This page explains more. Make sure that there is a path from your Router to the Mailtraq machine. This page explains how. Make sure your Domain Name is set correctly in the properties of Options | Server. Your domain name is the part after the @ symbol in your organization's email address. 'Domain Aliases' - one per line. If you are expecting to receive mail by SMTP be sure that the MX records for your domain point to the Mailtraq machine. This page explains how. Make sure you are using appropriate anti-virus software. This page explains more. Make sure that the SMTP Service settings are correct. This page explains how. Are you using a Cisco PIX firewall with the Mailguard feature turned on? Do you see 220 *************0*******200********* or similar log entries? This Microsoft KB Article explains how to resolve problems. If you have been running a trial or temporarily upgraded version of Mailtraq, has it Expired? If it has Expired, you will need to buy a license and then update the Installation Id. In the Mailtraq console, go to 'License Information' and then click the [Enter new Registration Key] button. Enter the new Installation Id from your invoice. Make sure that your ISP does not block Port 25 traffic. They may wish that you use their mail service. Mailtraq will not send mail out to the Internet. It just sits in 'Outgoing Mail'. Messages stuck in the 'Outbox'. See how to work with the Outbox controls to clear stuck messages. Port 25 blocked by ISP. Does your Internet Service Provider allow you to send mail on port 25? Some ISPs require that you have their permission to use a mail server if you do not have a business account. If you are on a 'home' account - contact their Customer Support to resolve this. See "How to check your SMTP connection" below. If they prohibit it then you will need to change Options | Outgoing mail to use your ISP's SMTP server. Mailtraq can be set to send mail to another mail server. Make sure that your firewall and router are set to allow traffic on port 25, 110, 80 and any other services you are using from the Mailtraq machine. Mail to AOL and other ISPs gets rejected. Some ISPs will only accept mail from known sources. Set Outgoing Mail to use your ISPs smarthost. There are Advanced controls for these settings - see Help in Options | Outgoing Mail. See this article to solve this issue. Some mail servers will only accept mail from you if you have a rDNS record. Read more here. Make sure that you do not have any anti-virus or anti-spam software installed that intercepts or blocks access to port 25. This page explains more. If you have been running a trial or temporarily upgraded version of Mailtraq, >has it Expired? If it has Expired, you will need to buy a license and then update the Installation Id. In the Mailtraq console, click 'Help | About Mailtraq' and then click the [Enter new Registration Key] button. Enter the new Installation Id from your invoice. How does Mailtraq think it is connected to the Internet? I see many messages passing through Mailtraq that I do not recognize. You may have an 'open-relay'. This page explains how to solve an open-relay problem. If you are getting email returned to you marked 'Blacklisted' or '550 - Relay Access Denied' or other 55* messages this page explains how to adjust your configuration for Blacklisted. This page for 'Mail Relay Denied'. 2.) 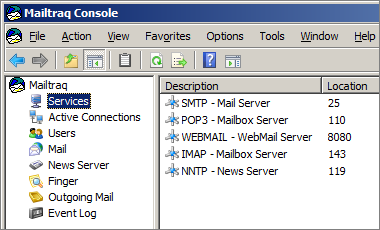 The 'Services' entry in the Console shows which ports Mailtraq has available. Services can be added, adjusted or removed as shown - right. Check that you do not have a default Microsoft (or other) service - such as IIS - running on port 25 (SMTP), port 110 (POP3), port 80 (webmail) or any other ports that you are wanting to use. This is particularly important if you are using a Server Edition of Windows - such as 2003. This page explains how. 4.) Using IPSec ? See the note below. 5.) Make sure you have allowed Port 25, Port 110, Port 80 etc on any local firewalls, such as the Windows Firewall or in your anti-virus software, otherwise you will not be able to send and receive mail. Some anti-virus and firewall software is 'application aware' so you will need to add Mailtraq to the list of allowed programs. If you need to discover which ports are in use by which program then you can use CurrPorts (32-bit or 64-bit) or a similar utility to view Process Services and Local Ports..
Or enter the following from the Command Line. which will list all listening and connected TCP ports and will list the PID (process) using the port. You can then discover which PID relates to which process/program by adding the PID column to the Task Manager. You need to run the command prompt as administrator. You can do that by right-clicking on "command prompt" in the start menu and go "run as administrator" otherwise it is only run as a limited user. Windows XP/2000/2003/2008 machines have a built-in IP security mechanism called IPSec (IP Security). IPSec is a protocol that's designed to protect individual TCP/IP packets traveling across your network by using public key encryption. Besides encryption, IPSec will also let you protect and configure your server/workstation with a firewall-like mechanism. This means that if IPSec has been enabled you must ensure that your security policy allows traffic on the ports that you need for mail transfer (typically 25, 110, 143 and 80, or the port you are offering Webmail on). Visit MS information page. If you cannot 'manually' Telnet to and from the Mailtraq machine on Port 25 then neither can Mailtraq or your email clients - so you'll need to look to the way your network, firewall or routers are configured. If you can connect, but don't get Mailtraq mentioned in the 'banner response' like the examples below, then some other program is using the port. You will either have to stop that program, change the port it is using, or change the port that Mailtraq wants to use. It normally essential for Mailtraq to have exclusive access to port 25 for successful mail transfer. See if you can connect to your Mailtraq machine - which has, for example, a local IP address of 192.168.1.1 - from another machine on your LAN. See if you can connect to an external mail server on Port 25 - you can try our test server - from the Mailtraq machine. If you don't seem to be able to Telnet on Port 25 at all, then ask your ISP if they block traffic on Port 25. A number of ISPs (Comcast, ATT etc) block port 25 to cut down spam. They can unblock on request. You can also Telnet to other ports to check their connectivity: Port 110/POP3, Port 80/webmail, Port 443/IMAP and so on. The webmail test does not give a simple 'banner response' but delivers a webpage, line by line after a couple of uses of the keyboard Enter-key. If you are finding that mail is not being delivered you should check that the DNS service that Mailtraq uses is returning valid information. Mailtraq picks up its knowledge of your DNS servers from the NIC (Network Interface Card). If you cannot 'manually' resolve a domain name then neither can Mailtraq. This test is done from the machine where Mailtraq is installed: Use 'enstar.net' as an example. A good response will show the MX records for the domain, giving machine names, and resolving them to IP Addresses, showing that Mailtraq has access to a valid DNS service. If you get a bad response you will need to investigate your DNS service. 1.) If the above did not answer your question, see the Help menu in the program itself. This has been written from a user's perspective (not by programmers). Context help is avilabale throughout the Console. 3.) There is detailed configuration advice available in the Knowledgebase. 4.) Other support options are outlined here.